Hamilton Extra Large Address Plaque - - with a wide exceptionally detailed border. 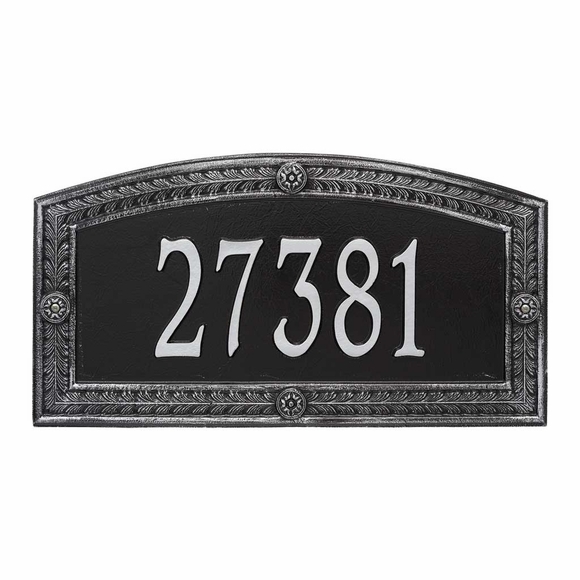 Custom made address sign personalized with your one-line or two-line address. Estate size 23.8"W x 12.6"H. Wall mount. Made in USA. The final finish is brushed by hand to enhance each detail. The one-line sign holds up to five (5) 5.5" numbers. The two-line sign holds up to five (5) 4" numbers on Line 1 and up to seventeen (17) 1.75" characters on Line 2. Large image shown in stunning bronze verdigris. Smaller images (from left to right): antique copper, black/gold, black/silver, bronze/verdigris, oil rubbed bronze, and bronze/gold. Dimensions: 23.8"W x 12.6"H x .375". Estate plaques are sized for increased visibility across large lawns. Ideal for larger homes.